The ultimate in warmth providing cozy insulation for cold climates and cool sleepers. This comforter is even warmer than our Extra Warmth design. It’s oversized and full of fluffy white goose down in a silky soft cotton cover. The Ultimate Extra Warmth Comforter is the only thing I have on my bed and I never keep my bedroom heated in the winter, and I am so comfortable at night. Like most truly great products, you spend a bit more money, but the quality and satisfaction you get is well worth it. Thank you for my comforter I love it. Our Ultimate Extra Warmth Comforter is fluffy, warm and inviting. 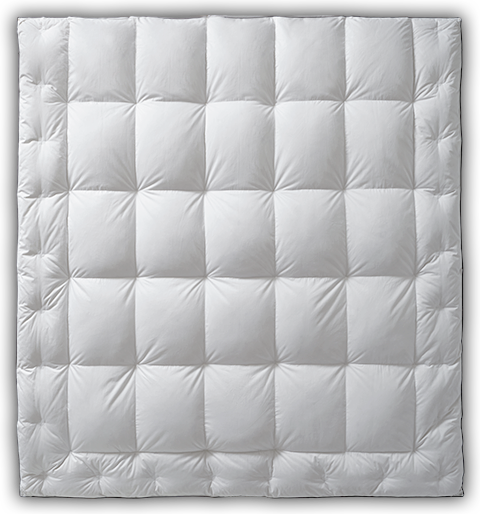 This oversized insulator is filled with a generous 600 fill power Hyperclean® white goose down covered with incredibly soft, 500 thread count 100% cotton. If you sleep on the cool side or live in a colder climate there’s nothing like snuggling under this cozy-warm bedding, an upgrade to our Extra Warmth design. The Comfort Lock® border will keep the fill from shifting to the outer edges while the three dimensional boxes inside the true baffle box design deliver a full loft and even warmth over your sleeping area. Enjoy the practical addition of duvet loops that you can use to easily secure your comforter inside its cover, plus the entire perimeter boasts contrasting navy blue cording -- our signature detail.